Additional Info: Fine monuments, cities and Portugal's wonderful landscapes shaped by man down the centuries. Discover the historic villages which are among the country’s best kept secrets. While Lisbon is a beautiful and culturally and historically rich capital city, I found the general feeling from the people not quite as welcoming as the northern City of Oporto (or Porto). Since my visit to the city, I have recommended everyone who heads to Portugal for any reason head to Porto, lest they miss out on an incredible city filled with remarkable people. Porto, Northern Portugal - the second largest city in Portugal and home to Port wine, or at least to where Port was originally shipped from. Its not a great place for people who have only picked up the word "obrigada" (thank you) in Portuguese as in my time there, excluding the hostel I stayed at, only a handful of people I met could speak English, but everyone was willing to try to communicate with me through a series of excited head nodding or shaking, hand signals and gesturing, and generally helpful seeming natures. While on a bus from the train station to some far end of Porto, actually overlooking where the river Douro opens up at its mouth into the Atlantic Ocean, I tried to ask the driver where my stop was. A helpful woman signaled to me that she would advise when to get off, but not only did she signal this, she got off with me and walked me up to the hostel - an unnecessary kindness which I thanked her for multiple times, "obrigada obrigada!! ", especially when she returned to the bus stop to wait for the next bus! First stop here is the tourist information office - be prepared to be overwhelmed by the friendly people working there - I left with so much information I couldn't see how I could leave this place after 2 days, as I had originally scheduled. 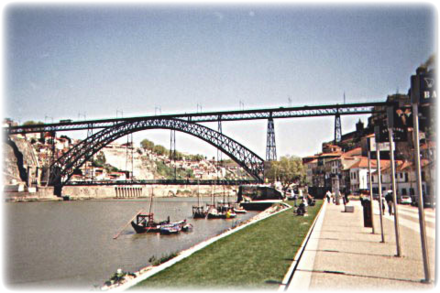 Porto is a beautiful city just to wander around - it is the city of bridges and its old town center is a UNESCO World Heritage Site. Among the architectural highlights of the city, the Oporto Cathedral is the oldest surviving structure, together with the small Romanesque Church of Cedofeita, the Gothic Igreja de Sao Francisco (Church of Saint Francis), the remnants of the city walls and a few 15th-century houses. Once at the river, I followed it back toward my night residence. The view of the Ponte D. Luis Bridge spanning the river with high banks of housing on either side was spectacular - I remember just stopping and smiling as people passed me (more locals than tourists) going about their day unaware of how lucky they are to live in this beautiful city. Some young artists must have got it as they sat in a small town square sketching in little drawing pads. 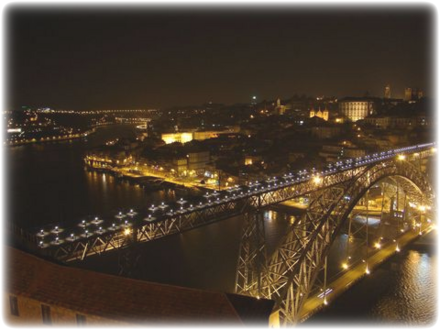 A tram runs along the river and, conveniently, almost all the way back east to the youth hostel that overlooks the city (HI Porto Hostel on Rua Paulo da Gama 551, bed from 14 Eur/night). 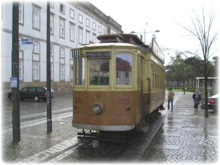 The tram is just 50c one way and goes past some of the best scenery in town, including: the Port lodges in Vila Nova de Gaia (the city on the other side of the river, south of Porto). I had the bad luck of twisting my ankle quite badly in Porto (3 older ladies rushed to my aid as I sat on the floor in blinding pain) but the lure of the city made me down some Advil and keep on going, determined not to miss out at all on my full day here. Once in the old part of the town, cross the bridge and try not to (go on I challenge you) take photos at every opportunity - it's like your camera can make postcard-perfect images in this place. My first stop (probably helped with the pain also) was the port houses along the south side of the river. Being a poor backpacker at the time, I opted to attend the free tours and tasting, although I am sure all of them were brilliant. The Sandeman House had a cool museum. The Ferreira Porto House is furthest walk up the river; I was the only one for the free tour and got a personal guided experience. In these tours, you will learn about the production of Port (the reaches of the valley of the Douro River in northern Portugal have a microclimate that is optimal for cultivation of olives, almonds, and especially grapes important for making the famous Port wine), and types and get to try the three: white, tawny and ruby. I found the white a pleasant surprise. Another tour I enjoyed was the Calem Port House tour, which has a larger facility than Ferreira. On the river outside, check out the traditional boats, Rabelos, which the port was brought down to the city in from the valley. In the area, you can walk along cobbled streets (though watch your ankle) strewn with washing lines and up to the best view of Porto. See some photos below to get an idea of how wonderful it is just to walk around here. Drift through parks filled with musicians and art works, fountains and little lakes, through tiny streets, tiled buildings (traditional Portuguese style), and just enjoy! The Portuguese aren't actually into hiking or walking for pleasure, and don't really get why you would want to. If you choose Portugal as a hiking destination, preparation is key as you won't find a great deal of hiking supply stores. That said, there is some excellent hiking to be done here, and it is pretty quiet due to the lack of interest from the locals. In the Algarve, southern region of Portugal, the Ria Formosa is a designated Natural Park and a stopping place for hundreds of different birds during the spring and autumn migratory periods. The Ria Formosa Natural Park and Castro Marim Reserve have many trails as well but keep in mind they can be fairly wild. There are also beautiful hiking trails in the northern region. There is a hike near the Douro River that leads up to the Calcada de Alpajares which is also called the Devil's Trail. This route is one of the older hiking trails in Portugal and leads to Quinta de Santiago which used to be an old pilgrim route. Along this route there are extremely remote villages far away from crowds. This circuit will give hikers a fantastic view of the Douro River as well as a look at some interesting rock formations. This trail is about 14 miles in distance and lasts about six hours. Portugal is a cyclist's delight, from its sparkling blue coast to the colorful wine country of the Minho and the sunwashed, Provence-like Alentejo region. Bike tour companies offer a guided bike tour of the wine country - the valleys of Minho, the emerald coast. Tours will typically include pedaling out from Oporto allon ght Rio Lima to Arcos de Valdevez, here there is a loop cycle through eucalyptus forests, mountain villages, and the granite peaks of Peneda-GerÃªs, Portugal's only national park. Next descend to Moncao, on Rio Minho and to the Spanish border. In Spain, you can visit ValenÃ§a do Minho or tour the Gothic cathedral in Tui, Spain (both close by) and then up the Spanish coast to Baiona, with its picturesque harborfronts and beachers. Typically these tours will shuttle you back to your start point, but you could plan a similar trip and plan to cycle back or continue on from here. Portugal's "Costa Azul" (Blue Coast) is another great spot for a 6 to 7 day bike ride. 25 miles south of Lisbon, start a tour in Sesimbra and enjoy the beautiful views of the ocean as you pedal along. Take time out to rest the legs on a half-day cruise on an antique wooden sailboat that will take you south in historic style to the Troia Peninsula for endless dunes to join you on your cycling adventures. Head south to Cabo Sardao past windmills and to the towering cliffs until you reach lands's end at Cabo de SÃ£o Vicente (Cape St. Vincent) - it is the southwesternmost point in Europe. The cape is a site of exuberant marine life and a high concentration of birds nesting on the cliffs, such as the rare Bonelli's eagle, peregrine falcons, kites, rock thrushes, rock pigeons, storks and herons. 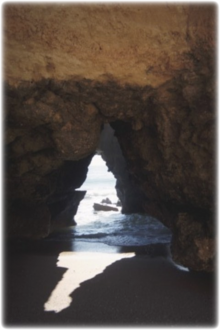 Finally head over to largos and relax in warm waters and explore beachside caves in the Algarve. As 70% of the world lies just below the surface, snorkeling is a great way to pass some time down in the Algarve. The Algarve was recently nominated as Europe's Top Dive Destination in the 2007 world travel awards. You could see dolphins in the summer, rays, conger eel, whiting-pout, sea bream, sea bass, scorpion fish, toadfish, groupers, snappers, blenny, hogfish, squirrelfish, octopus, lobsters, crabs, starfish, cuttlefish, colorful nudibranchs (sea slugs), razor clams and bryozoans.